They had none left (Thrifty, advertise what you have, not what you don’t), but when I asked the old man at the counter in the lot about the Cadillac CTS and the Camaro convertible sitting front of the booth, he simply said after checking my reciept from the counter, “Just take it, no extra charge.” I dropped my luggage and jacket in the trunk, threw the Camaro in gear, and set off to my grandmother’s condo. 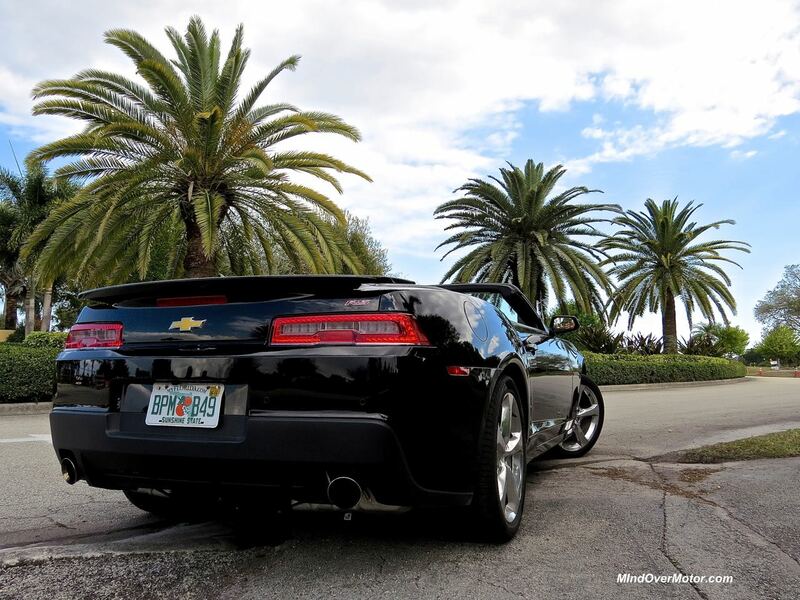 As I drove it from Fort Lauderdale International to the great city of Boca Raton (where I was the youngest man driving a convertible for miles and miles), I asked myself a question: “Can the V6 Camaro Convertible be a lot more than just a rental car, or only that?” A few days, a tank of gas, plenty of bugs in the mouth, and a few beers later, I had found an answer. The interior is a big improvement since the mid-cycle refresh was completed around 2012. The steering wheel isn’t as imposing as it was at launch, which helps bring out the rest of the interior. The shifter still looks terrible, but the console gauges and jeweled instrument panel still provide the right atmosphere. 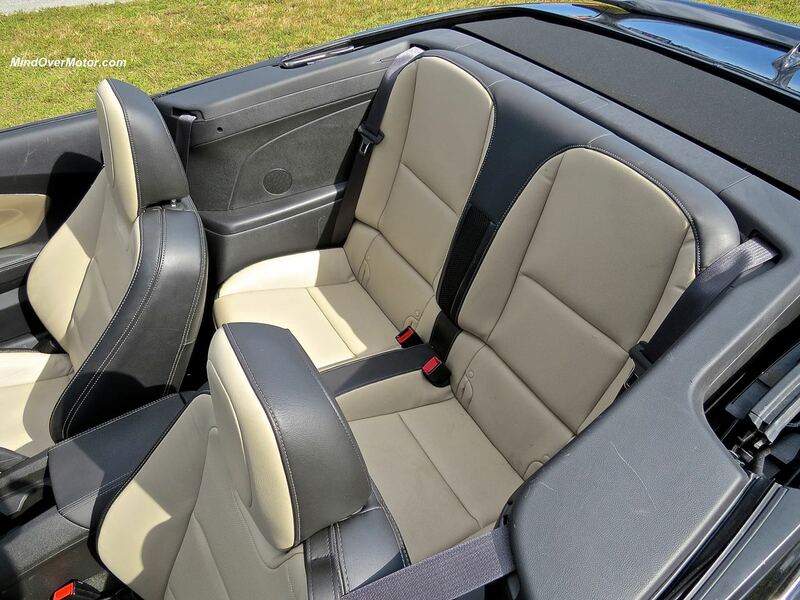 The leather on the seats, though, still looks cheap—at 40 grand for this particular car, I expect better (then again, it’s still a Chevy, so I should take that back). When it comes to the quality on the Camaro, Chevrolet hasn’t at all done a bad job. Gone are the days of questionable paint quality, bad shut lines, and heavy rattles. Thrifty had taken care of this convertible before I got my grubby hands on it—and it showed. The paint was shiny and lacked any sort of runs, while the car was put together well—it takes rental abuse rather well. After I’d ran it over a few parking stumps in Boca and ran it into a curb a few times parking it down at Mizner Park, still no damage. Not bad for a Camaro. 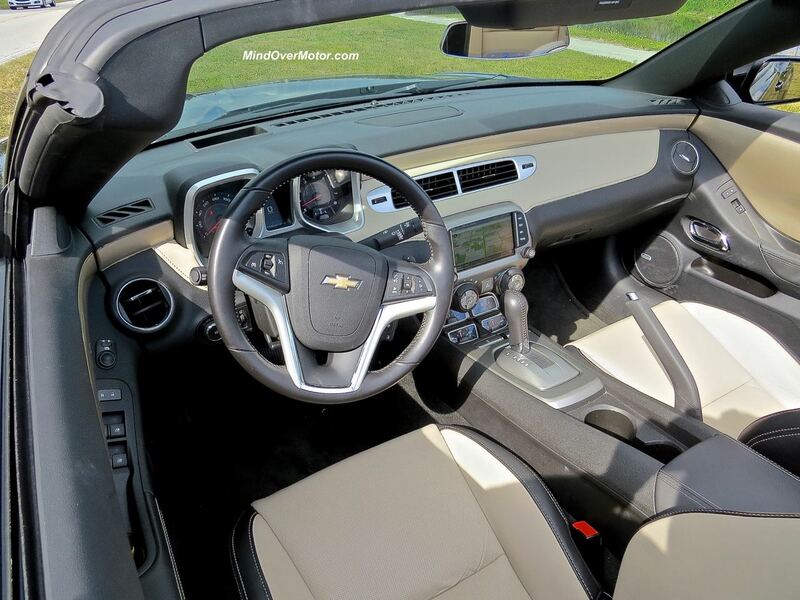 The interior quality, of course, is a good example of why GM is improving the way that it is. There’s still panel gaps between the top of the dashboard and the center stack, but stitched leather is all over the place on this model—and it doesn’t look hacked together at all. The shifter bezel feels cheap, but it moves well and doesn’t catch between selections. 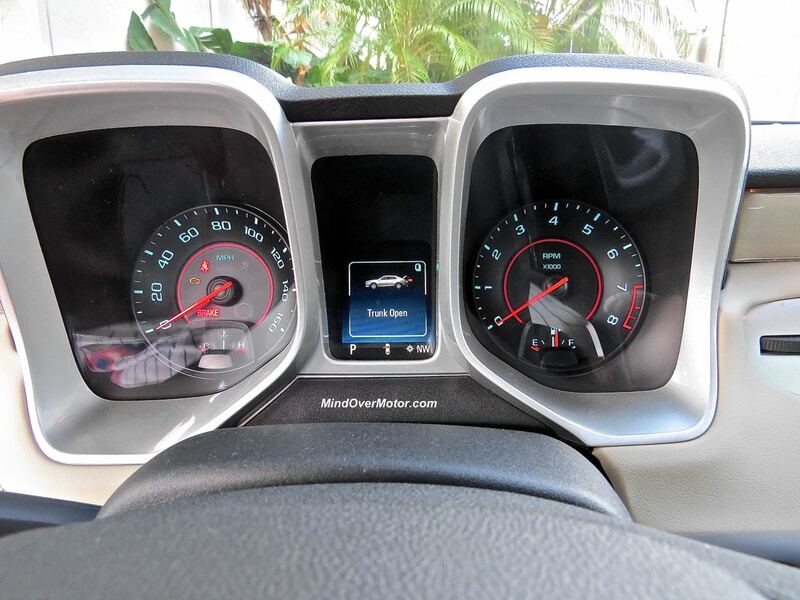 The haptic Chevrolet MyLink system, though, is trash. It’s plain and honest trash. The haptic controls on either side of the screen don’t register fingers all that well, and the touch screen itself wasn’t very intuitive, even after a few days of getting used to. 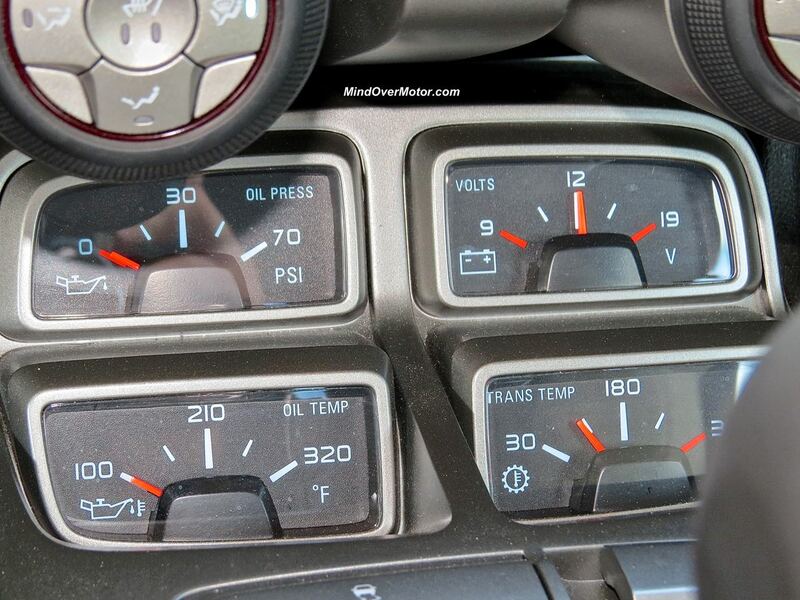 Thankfully, Chevrolet left behind a volume and a tuner control knob, so all isn’t lost. The HVAC controls are also big enough for someone wearing gloves to use—so if you’re a golfer, or a Yeti, or anything with large hands, you will enjoy using them (although why anyone puts the A/C on in a convertible is beyond me). The top operation is fairly smooth, but if you’ve forgotten to put the cargo cover in place, you won’t be able to put the roof down. Alas, the release handle in the center is a fairly hefty piece—so lift weights if you want to unlatch the roof without straining your wrist. Still, for a car like this, it’s well-made and not at all a deal breaker. Plus, in South Florida, why keep the top up? Biggest problem with the Camaro? This one’s not an SS. While I happen to like GM’s High Feature twin-cam V6, which in this case is the oft-found 3.6L variant pumping out a rather healthy 325hp, it’s not a muscle car engine. This one’s also paired with a six-speed automatic, which doesn’t help in the fun department much. Then again, as a cruiser, the V6 is relatively quiet at cruise, and the combination does provide relatively smooth acceleration. Still, it’s not brutally fast—the Camaro droptop weighs 4,078 pounds in 2LT trim—just a touch heavier than the lightest model of the new Ford F150 pickup. That’s right, this “sports car” weighs as much as a truck. This thing needs to go on a diet more than I do, a rather scary prospect. The transmission is decent for a rental, but not great every day. It shifts smoothly and general doesn’t make a fool of itself—and the paddle shifters are correctly designed, so it’s fun to change gear. 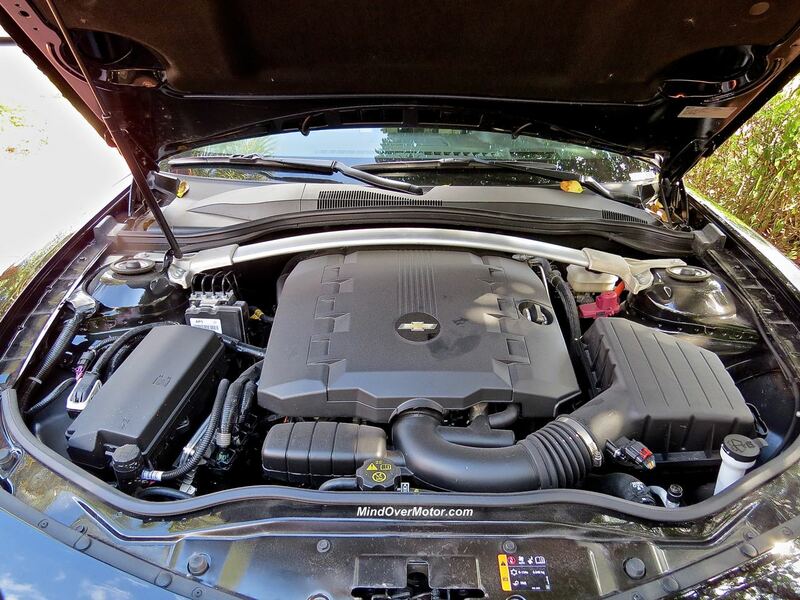 The engine note, is typical GM V6—sounds fine when not being strained, but floor the gas and it screams in a bad way. It’s not pleasant, and it’s not at all suiting a Camaro. The engine feels strained when pushed hard, despite the ample power figure. Passing power is decent and at 85MPH, the Camaro V6 does cruise nicely. Thankfully, even with the TCS on, it still chirps the tires off the lights. The handling and brakes, however, aren’t quite what I want. While the brakes are very strong and lack fade, the front end still nosedives. Thanks to the high weight, the body leans out a bit too much in corners. Grip from the larger tires is decent—enough for most people, but the V8 does get bigger meats for the extra power. The ride, however, is very good. While the Camaro rides firmly, it’s not at all harsh. Cowl shake is nonexistent, a good thing on a car this large. The seating position is good for performance driving but it could absolutely use better visibility over the shoulder with the roof up (then again, as a convertible, that’s no surprise). 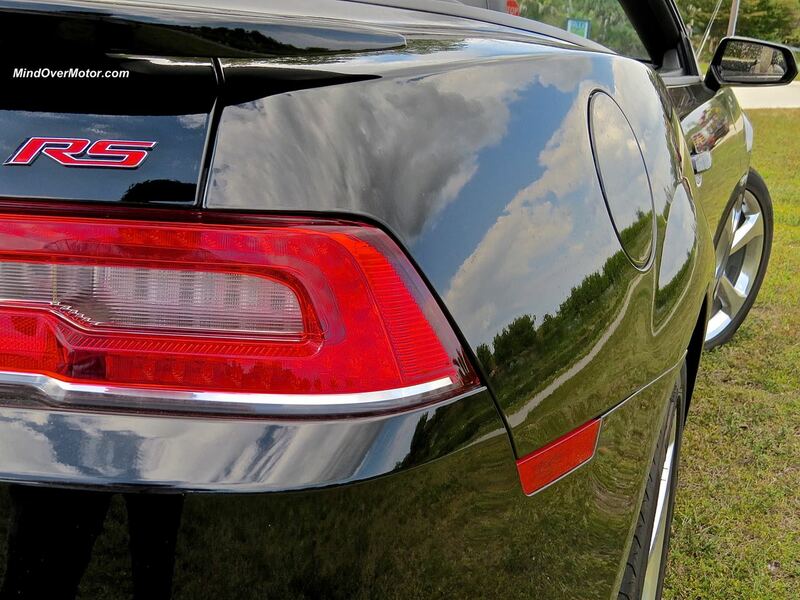 It is, however, easier to see out of than the coupe. 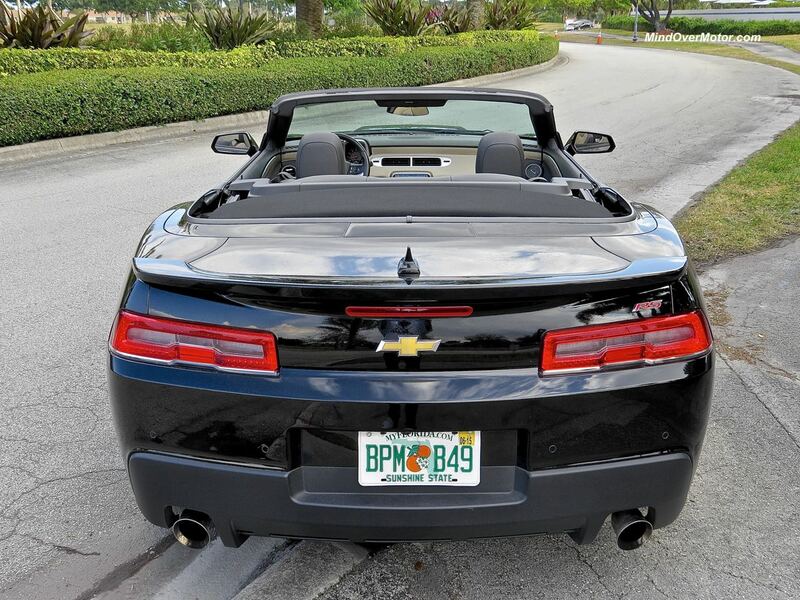 The Camaro 2LT Convertible I had for five days was a solid rental car. However, when push comes to shove, people do buy V6 Camaros, and I have to look at the cost. The 2LT convertible starts at $35,105—not cheap. 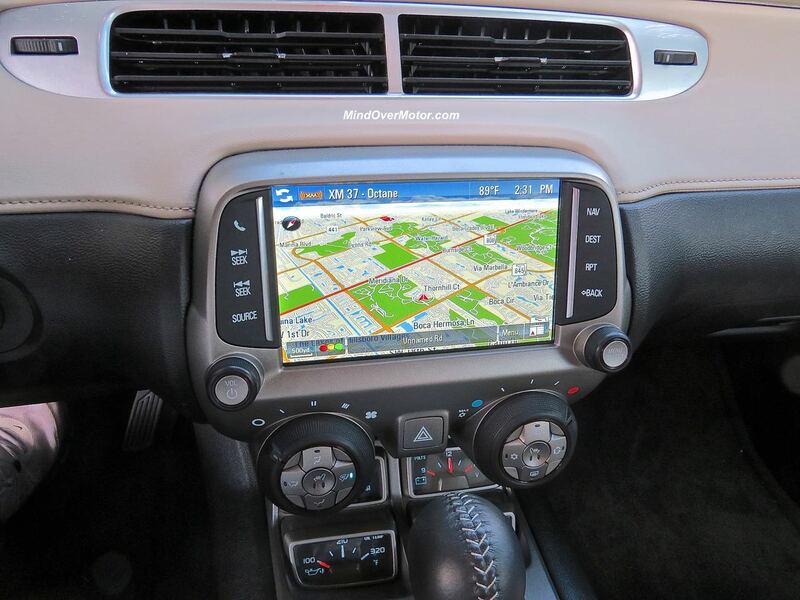 It’s a brutal $39,540 fully loaded, which included the RS package (which supplied the gorgeous LED surrounds for the low beam headlights), an automatic transmission, navigation (MyLink is standard), and destination. 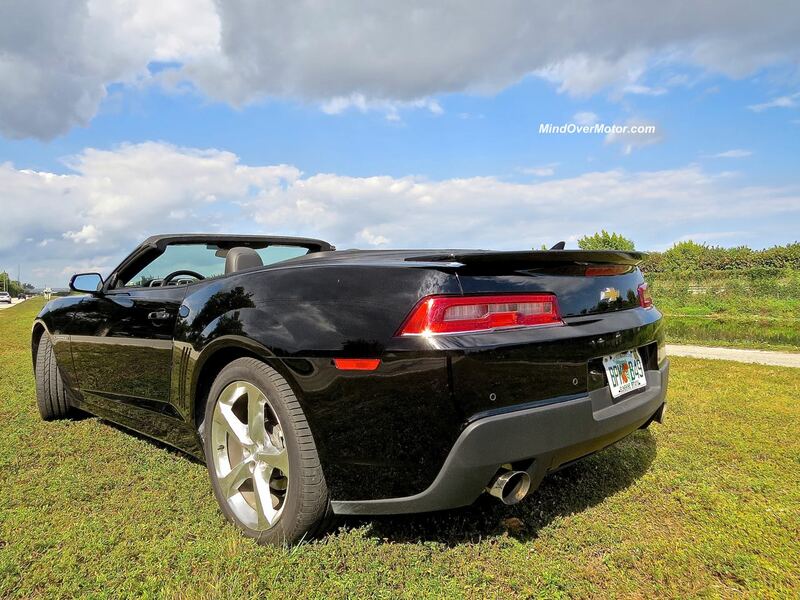 $40K is a lot of money right now—a base 1SS convertible (which loses options but gains the all-important Chevy V8) is just a thousand dollars or so more than this thing. 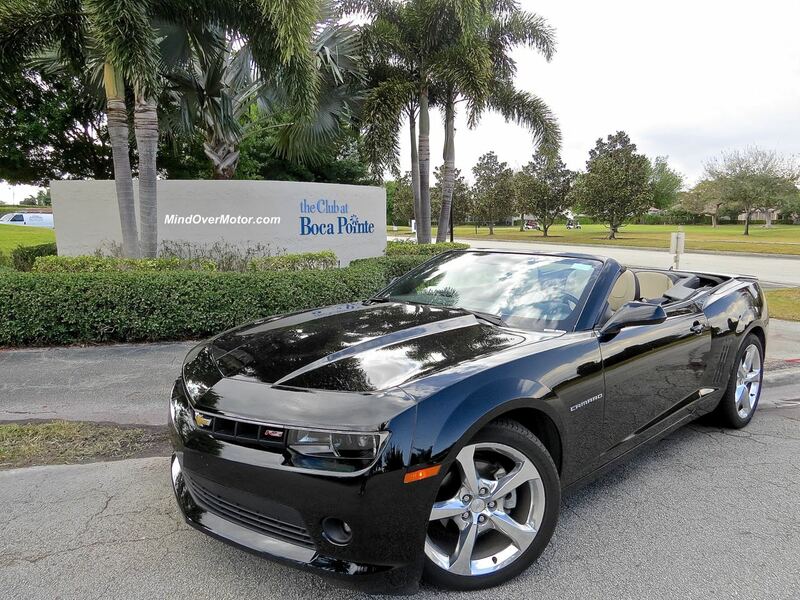 It’s eight grand more than the coupe as well—something I just cannot understand (The Camaro convertible starts around 33K, the coupe starts at 24). It’s just not a good value as an every day car. 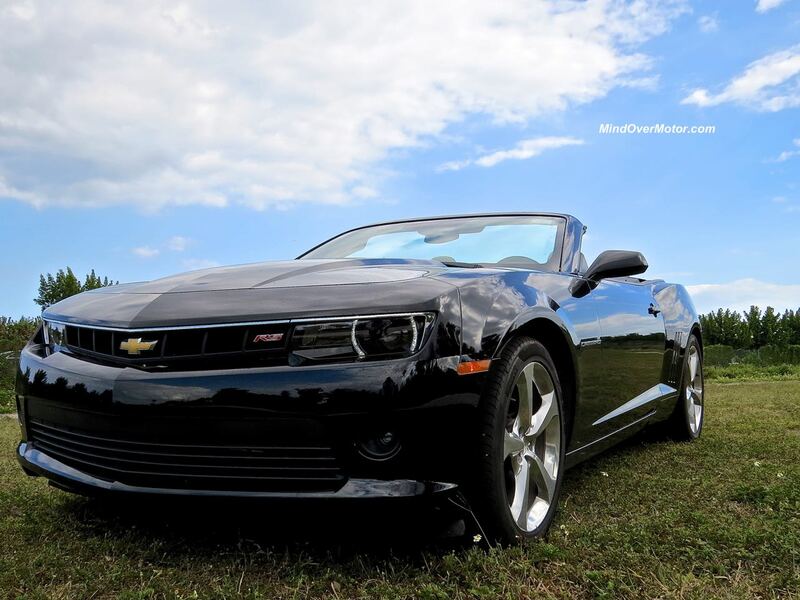 While I get the V6 Camaro’s whole point (volume seller/fleet car/people who can’t get insurance for the SS), I’m not a big fan of it. The Camaro on its own has other issues. 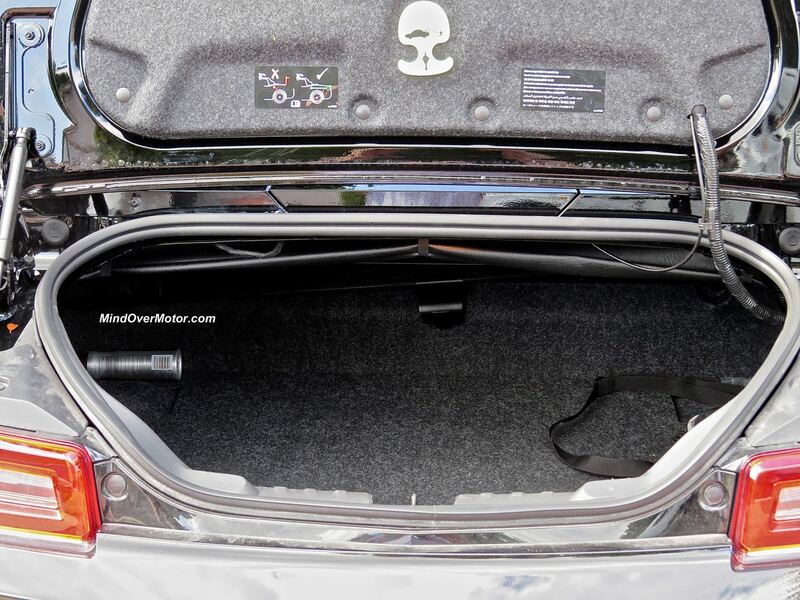 I had major issues with the trunk; the lift-over for anyone under 5 foot 10 is a nasty practical joke. I’m sure Chevrolet didn’t mean it, but I couldn’t stand trying to reach in the back to grab a camera bag. The seats are comfortable, and I did manage to fit two rather tall people (my aunt and uncle) on a short drive to dinner one night, but I cannot guarantee their comfort for more than a few miles at a time. If this wasn’t a rental car, I wouldn’t have enjoyed it. However, because I had it for five days, and it wasn’t an awful car for a short time, I did have plenty of fun in it. The benefits of being a great boulevard cruiser are big for a twenty something guy who’s on vacation in Florida–but the downsides of something that’s tough to park (it’s bigger than you’d expect it to be), not fast enough to be called a muscle car, and a bad infotainment system all combine for something that I think is a good holiday romance–but is not a thing I want to live with long-term. Honestly…you guys are better than any motor mag on any given day. 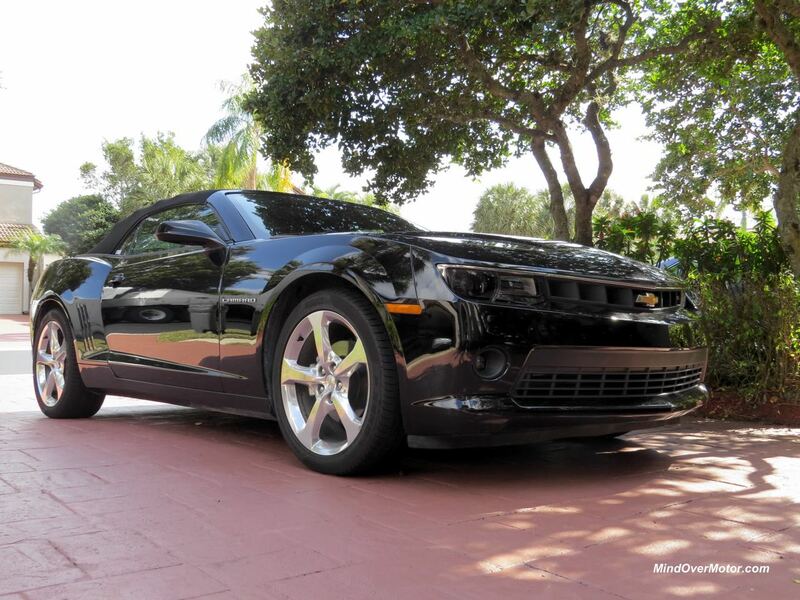 I’m strongly considering a used Camaro V8 as my play car…hardtop and leaned as possible on any extras. You guys have made quite an impact. As usual…THANKS! Thanks James! We just try to to give our honest take haha.